Truth be told, I’m still a big fan of the old LR4. In fact, if Land Rover had wedged the Td6 turbo-diesel engine under its blocky grille for our market I’d already be an owner. Then again, I would’ve purchased it long before the all-new 2017 Discovery arrived, at which point I would’ve wished I’d waited. After all, there’s much the Discovery does better than the LR4, but before we delve too deeply into all the improvements we should pay our respect to one of last classic big box 4x4s on the market. The LR4, simply known as Discovery in other markets, perfected the original squared off chockablock look it inherited from the LR3 in 2009. The two models were almost identical in shape and measurement, but anyone who’d seen, entered and then drove both would tell you the experience was night and day. This new fifth-generation Discovery can make that claim tenfold. For starters, it no longer looks like geometric linear art. Yes, lovers of the rolling rectangle will need to look elsewhere now that the LR4 is gone, although the new Discovery pays homage to the outgoing model’s asymmetrical rear liftgate with a subtle take of its own, and the rear rooftop is once again raised with rounded glass edges added. The entire design pulls its curvaceous cues from the brand’s smaller Discovery Sport sibling, however, and even some pricier Range Rover models, particularly its lighting elements. Most should like the new look, its less truck-like styling a good precursor for what’s underneath. 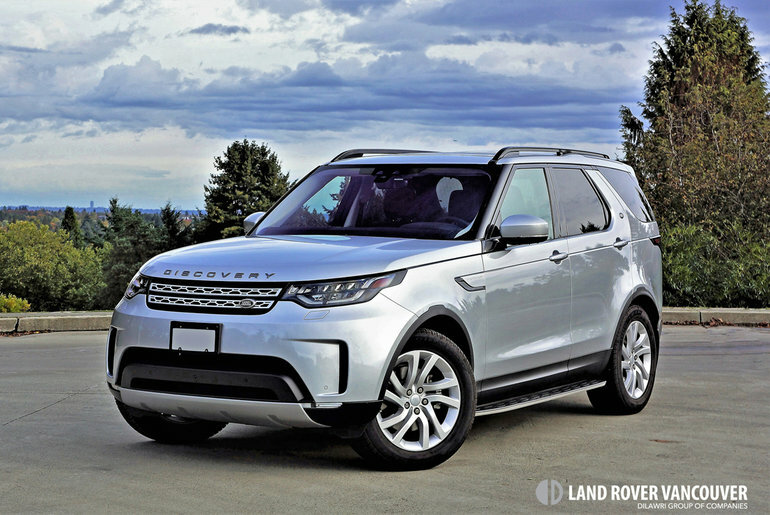 The Discovery “5” leaves the old Integrated Body Frame (IBF) platform architecture behind for an all-aluminum monocoque body shell and aluminum suspension design already utilized by the mid-size Range Rover Sport and full-size Range Rover, making it 480 kilograms lighter for much more entertaining driving dynamics and wholly improved efficiency. We can quantify the latter, the previous LR4 with its 3.0-litre supercharged V6 achieving a 16.2 L/100km city, 12.1 highway and 14.3 combined five-cycle rating from Transport Canada, whereas the fleeter new Disco with basically the same engine boasts a much more hospitable 14.7 city, 11.2 highway and 13.0 combined. Now, of course, there’s the turbo-diesel option, which hits the LR4 below the belt with a previously unfathomable 11.2 L/100km city, 9.0 highway 10.2 combined rating. A bit more about those engines: the base 3.0-litre supercharged V6 is good for 340 horsepower at 6,500 rpm and 332 lb-ft of torque at 3,500 to 5,000 rpm, whereas the as-tested 3.0-litre turbo-diesel V6 makes 254 horsepower at 3,750 rpm and 443 lb-ft of torque at 1,750 to 2,250 rpm. Both mills are mated to a ZF-sourced eight-speed automatic transmission featuring final drive ratios of 3.73 in the gasoline version and 3.21 in the diesel, while power goes down to all four wheels via the brand’s renowned full-time four-wheel drive with a locking centre differential and optional rear locking diff, plus the brand’s driver selectable “Terrain Response” system. If you prefer off the line performance over fuel economy and arguably better tractability off-road, the gasoline engine sprints to 100 km/h in 7.1 seconds compared to 8.1 for the diesel, while both achieve a 209 km/h top speed. For 2017 the diesel can’t be had in base $61,500 SE trim, but this will change for 2018. Until then you’ll need to add a premium of $2,000 to the $68,500 HSE, $75,000 HSE Luxury or $82,500 First Edition, which seems a small price to pay for its many efficiencies. SE trim comes standard with an independent coil-spring suspension, 19-inch alloys, proximity-sensing keyless access, pushbutton ignition, an electromechanical parking brake, power-folding heatable side mirrors with approach lights, rain-sensing wipers, 12-way powered front seats, leather upholstery, a colour TFT multi-information display, dual-zone automatic climate control, ambient lighting, an auto-dimming rearview mirror, rear parking sensors, an 8.0-inch infotainment touchscreen, a reverse camera, navigation, 250-watt 10-speaker audio, Wi-Fi (for up to eight devices), a Homelink garage door opener, overhead sunglasses storage, front and rear fixed sunroofs, five seating positions, a foot-activated powered gesture tailgate, hill descent control with off-road ABS, Hill Launch Assist, Gradient Acceleration Control (GAC), plus all the usual active and passive safety features, etcetera. SE and HSE buyers can upgrade to the seven-seat comfort pack for $2,650, an option group that adds two third-row seats, the air suspension, and bull low-range gearset. Move up to the Discovery HSE and LED headlights get added, as do fog lamps, 20-inch alloys, tri-zone auto climate control, in-dash storage behind the climate-controls, a 10.0-inch touchscreen, a 380-watt Meridian audio system, the InControl Remote phone app, front memory seats, a powered panoramic sliding moonroof, hardwood inlays, front parking sensors, a unique powered inner tailgate, and more. If you’d like to add a third row, the air suspension, and power-folding rear seats as standard equipment you can move up to the HSE Luxury, which also upgrades the powertrain with a two-speed transfer case (high and low range) while adding unique 20-inch wheels, chromed door handles, 16-way powered front seats, Windsor leather upholstery, heated rear seats, a heated steering wheel, interior mood lighting, 14-speaker 825-watt Meridian audio, etcetera. The top-of-the-line Discovery First Edition adds Terrain Response 2 and All-Terrain Progress Control, plus lane keeping assist, autonomous emergency braking, park-assist, a 360-degree parking camera, blindspot detection, an Intelligent Speed Limiter with traffic sign recognition, a waterproof wrist strap Activity Key you can wear anytime you don’t want to take your keys with you (just press the “D” on the rear “DISCOVERY” nameplate to get back inside), a heated windshield, 21-inch alloys, a power adjustable steering column, Cartography interior trim, a load space cover, and more. My tester was the HSE Luxury Td6, which means that along with the load of features just mentioned it’s a considerable step up in refinement from the LR4, which as noted was already a massive improvement over the old LR3. Most everything above the waist is made from high-quality soft-touch synthetics, leathers, hardwood, and metal. It’s the real deal too; the open-pore woodgrain so zealous in its effort to come across as legitimate you’ll need to be careful of slivers. The switchgear is superb, my favourite element once again being the conceptually carried over rotating gear selector knob that powers up from the lower console upon startup, this finished in a grippy rubber rim instead of the knurled metal that blings up the same feature in Range Rovers. I’m happy either way, this being a slightly more utilitarian family vehicle than your typical Range Rover. Still make no mistake, as the Discovery is parked squarely in the luxury segment. Range Rover, on the other hand, is targeting a position above all other premium brands, as evidenced in a nicely loaded up Velar that I drove more recently—review forthcoming. Unlike the Velar, the Discovery didn’t completely blow my mind with respect to electronic interfaces. Its primary gauge package is nicely laid out with the usual dual analogue dial setup flanking a large, colour multi-information display at centre, but it wasn’t an all-encompassing fully configurable colour TFT display, while the upgraded 10.0-inch infotainment touchscreen on the centre stack is very good, but it wasn’t awash in multi-screen digital brilliance like the Velar either. Still, it’s a solid step up from the LR4 and anything previously offered by Land Rover, and easily competitive within its segment, with all the features and functionality most could want, such as tap and swipe capability, Apple CarPlay and Android Auto, accurate navigation, an excellent parking camera with multiple viewpoints including overhead, and more. Like the LR4, the Discovery continues forward as the brand’s roomiest offering, but in this respect it’s probably best not to even bother comparing old versus new as the outgoing model starts to look pretty shabby when interior spaciousness and comfort enter the picture. Whether seated in front, in the accommodating second row, or relegated to the rearmost compartment the new Disco is a modern-day revelation, the driver’s seat providing near ideal ergonomics for my slightly under-male-median-height five-foot-eight frame. With the front seat set for my height and the second row slid as far rearward as possible I had about five inches ahead of my knees when seated behind the driver, plus six to seven inches above my head. As far as side-to-side roominess goes, there shouldn’t be an issue for even three adults. Getting in the very back only requires the pull of a seat-top lever before sliding either second-row seat forward, after which it’s an easy climb up. What’s more, even with the second-row seats slid all the way into their rearmost positions (they offer 450 mm of fore and aft travel) I still had a few inches ahead of my knees and three to four inches above my head. The two third-row seats are also quite comfortable, although it feels like you’re sitting on top of them rather than in them. Land Rover has carved out the side of the left passenger area so there’s plenty of space for an outside arm, plus cubbies to store things on both sides. It’s a comfortable and airy feeling rear compartment too, especially due to the glass roof overhead. Additionally, thanks to that aforementioned stepped rear roofline the third-row sits higher than those ahead resulting in a “stadium style” seating position for better forward visibility, while Land Rover also lowered the first- and second-row seatbacks slightly so those in the very back get a less impeded view through the front windshield. It’s also easy to get out of, even if you get left in the final row without assistance. As for a comparison to its predecessor, the Discovery’s are some of the best third-row seats in the industry, whereas the LR4’s weren’t. Likewise for transforming those rear seats into storage space. When all three rows are in use there’s little cargo room behind the rear seatbacks, but this is common in the mid-size SUV class and there’s more than before. You can fit in a small duffel bag, a briefcase or two, but no golf bags or luggage. Fortunately, you can purchase some specially fitted Thule roof carriers from the brand’s accessories catalogue for just such purposes. Back to the SUV at hand, an innovative feature never seen in any other vehicle is the internal tailgate noted earlier, which powers down to provide a handy shelf with a 300-kilo payload capacity in place of the LR4’s tailgate. Its finishing is amazing, with carpeting front and back, plus high-quality metal edges boasting exquisite chromed detailing. Likewise for the entire cargo compartment, its workmanship amongst the best in the entire mid-size SUV segment. Buttons on the left cargo wall let you lower or raise the pneumatic suspension to ease load-in, while another set powers the 50/50-split third row completely flat. The chromed tie-down hooks are really thick and strong, again some of the nicest you’ll find in any competitor, plus pullout grocery bag hooks add yet more convenience. I should also mention a small compartment below the rearmost portion of the load floor, handy for work gloves, rags, or anything you might want to stow out of the way. With the rear row folded there’s a sizeable 1,231 litres behind the second row, while cargo capacity grows to an impressive 2,500 litres with the second row folded completely flat. What might be this Landy’s most jaw-dropping feature is its ability to fold those seats from the comfort of the driver’s perch via the Intelligent Seating system. Seriously, you can adjust every second- and third-row seat electronically from the infotainment screen or through an app on your smartphone, with up to 23 configurations possible. You can also drop the headrests if you want better rear vision. The system senses weight and resistance so as not to damage anything on those seats including passengers, so don’t worry if you forget that Fido’s dozing in the third row. Really, the Intelligent Seating system is a big help for anyone who regularly picks up and drops off kids and their gear. Storage in mind, there’s a hidden velvet-lined nook behind the HVAC interface that reveals itself by powering the panel out of the way after pressing the “OPEN” button on the top left, while the lower centre console cupholders can also be moved forward to expose a large cubby capable of housing a quad of tablets or what-have-you. You can get a fridge capable of cooling four bottles or cans under the console bin lid too, although my tester’s was simply filled with dual USBs (you can get up to nine strewn throughout the cabin), HDMI and SD card slots, a 12-volt charger (there are six all-round), and ample room for storage. And while we’re on the subject of hauling, the Disco will trailer up to 3,720 kilograms. You’d think by the gist of this review the new Discovery was all about size and convenience, but it’s improved in every other way too. As noted earlier, the aluminum-intensive bodywork makes for a stiffer, stronger and much lighter structure that together with a much more crossover-like chassis architecture benefits everything from driving dynamics to refinement. It’s extremely quiet inside, even when factoring in the diesel at idle, extensive sound deadening another important part of the equation that’s made obvious when powering down the windows. No worries, just leave them rolled up with climate control to keep everyone happy and the Disco is a whole new kind of luxury, combined with one of the nicer rides in the class as well as an entirely new level of agility. The diesel gets the big SUV moving with enough verve to cause a smile, while the eight-speed automatic shifts as close to seamless as one could hope for. Land Rover includes paddle shifters for getting sporty, and while the big Disco is no Evoque in the handling department it’s yet another night and day improvement over the comparably top-heavy LR4. It tracks confidently amid tight fast-paced corners and is a dream on the open highway where it can cruise tirelessly at high speed all day long. Those paddles would no doubt come in handy for off-roading too, the Discovery said to be capable of most everything its predecessor was when pavement ends and trail begins. Unfortunately I didn’t have opportunity to scale the local mountains or wade through any creek beds in my tester, but I’ve done my share of bushwhacking behind the wheel of various Land Rover and Range Rover models and have never been disappointed. By the numbers the Disco looks good, its optimal ground clearance up to 283 millimetres, wading depth up to 900 mm, departure angle at 28 degrees, approach angle at 29.5 degrees, side-tilt limit at 35 degrees, ascent/descent ceiling at 45 degrees, etcetera. Its four-wheel drive system is permanent with a locking centre differential while the available Terrain Response system (standard on First Edition models) adds a locking rear differential as noted earlier. Its compliant suspension should allow for excellent manoeuvring through deep ruts, the Disco providing a full 500 mm of axle articulation, while it likely won’t beat your backside up on extremely rough patches of trail. The air suspension also lowers when getting out, making ingress and egress easier for shorter folk like me. While I still love the rough and rugged image the old LR4 espouses, I must admit that I’m now solidly in the new Discovery’s camp. It does everything the LR4 was capable of and so much more, while executing its tasks with a new level of quiet, refined confidence and ultra-convenient roominess, all while using much less fuel. Truly, you’ll be hard pressed to find a better luxury SUV for your family than the new Discovery.